The Fantasy genre is a genre that should have a near-infinite potential for imaginative world-design, innovative societies and novel ideas. This potential is often squandered and most Fantasy novels have little original world-design in them, the maps may be different and the names of the nations new but there is a definite tendency to reuse ideas from medieval European history or to reuse traditional Fantasy ideas familiar from the likes of Lord of the Rings or Dungeons and Dragons. There’s not necessarily anything wrong with using a familiar setting if the storytelling is good enough but it is nice to have the occasional book which does have some innovative ideas in it. 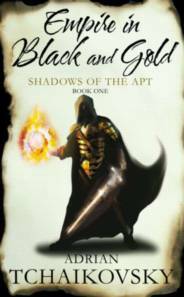 Adrian Tchaikovsky’s debut novel “Empire In Black And Gold” (the first book in the 10 volume “Shadows of the Apt” series) is one example of a book that may in places reuse a few common Epic Fantasy tropes but also has plenty of unique content. The defining concept of the world-building in the series is the idea that humanity in Tchaikovsky’s world is divided into different races (called kinden), each of which appears basically human but takes some characteristics of a certain species of insect (or arachnid). For example, the Beetle-kinden are typically short, stocky and inelegant, they are industrious and good at manual labour, their cities are dominated by their factories. The Spider-kinden excel at trapping prey in their webs, although in a more metaphorical sense than actual spiders, they are excellent manipulators continually scheming against each other and inveigling others into doing their bidding. The Moth-kinden are nocturnal, capable of flight, they are scholars and philosophers but are baffled by the factories and machinery of more practical races such as the Beetles. Similarly, the Mantis-kinden are expert warriors, Butterfly-kinden are bewitching and unworldly and Ant-kinden have hive minds with an entire city able to think as one. It is an unusual concept for a fantasy world and one that initially takes a bit of getting used to but Tchaikovsky’s world is well thought-out and the interactions of the different races are convincingly portrayed. Most of the book takes place in the Lowlands, a collection of loosely-allied cities of various kinden. The dominant force is the cities of the Beetles, a society reminiscent in many ways of Victorian Britain (or the Steampunk subgenre) with large factories, railways and airships linking the cities, built on the Beetles’ aptitude for engineering with wealthy merchants and squalid slums all packed together. With no instinct for conquest they are happy for their society to grow wealthy trading with the Lowlands other races, the aristocratic Spiders, the squabbling rivals of the different Ant cities, the itinerant Flies and, deep in their forest and mountain strongholds, the Moths and Mantids that were previously the rulers and soldiers of the Lowlands before being overthrown in a revolution centuries past. The Lowlands tranquillity is under threat from a new power approaching its border, the aggressive Wasp Empire, a highly regimented and militaristic society whose sole purpose is to expand as fast as possible and conquer their neighbours. Most of the Lowlanders are blind to the danger the Wasps pose, believing that they will honour their treaties promising peaceful co-existence, the Beetle merchants are happy to grow rich from selling supplies and weapons to the Wasps during their long war with the distant Dragonfly Commonweal – meanwhile the Ants are too busy fighting with their fellow Ant cities and the Moths and Mantids are too absorbed in brooding over past defeats to worry about the future. One man who sees the danger the Wasps pose is Stenwold Maker, a Beetle artificer and lecturer in Collegium, the Beetle’s cultural centre. Twenty years before he was part of a small band attempting to stop the Wasps’ conquest of the city of Myna, the members of his band being forced to flee the sack of the city after being betrayed by one of their own. Since then he has been trying to warn the Lowlands of the dangers the Wasp Empire poses but his fellow lecturers and the merchant lords of the Beetle cities dismiss him as a paranoid lunatic. He has also been attempting to build up a network of agents in various Lowland cities to covertly fight against the Wasps’ own agents. Many of his agents are his former students and after an attempt is made on his life some of his current students help save him from the attack. Realising they will also be potential targets for Wasp agents he sends his students to join up with the rest of his network in the Beetle capital of Helleron, despite having some misgivings since his current students are inexperienced and naïve and two of them are from his own household. The group of four are the main protagonists in the book, consisting of Tynisa, Stenwold’s Spider-kinden foster-daughter, Che, Stenwold’s Beetle niece, Salma, a student and minor royalty from the far-off Dragonfly lands who lost many of his family in wars against the Wasps and Totho, a half-breed Beetle and aspiring engineer. Thrown in at the deep end, they find themselves sharing an airship ride to Helleron with a Wasp captain supposedly on a diplomatic mission and when they get to the city they find Stenwold’s network compromised. As the novel progresses some of them will find themselves betrayed by their own kinden, forced to go on the run through Helleron’s underworld, captured and enslaved by Wasps and ultimately forced to confront some surprising revelations about their own identity. As previously mentioned, the world-building is possibly the best thing about the book (which is not to say it is necessarily lacking in other areas). As well as the novelty of the different kinden there is also plenty of depth in the portrayal of the interactions between the different kinden. Issues of racism and prejudice are repeatedly explored and there are plenty of echoes of real-world history and current events in the portrayal of imperialism, the benefits and dangers of capitalism, the evils of slavery, the perils of appeasement, the prejudices against mixed-race relationships and the clash between progress and traditional ways of life. Fortunately Tchaikovsky is never heavy-handed either in explaining the world-building or the themes of the novel and there’s a lot more telling than showing with the author managing to describe the world without either excessive description or clunky exposition. The plot is original, interesting and compelling as well as being consistently entertaining. It is fast-moving and manages to cover a lot of ground and reveal a lot of the world while still including plenty of interesting character interactions, a few intriguing mysteries and some pretty good fight scenes. Occasionally it is not entirely convincing and can sometimes feel a bit contrived, especially in the early stages. It doesn’t really seem plausible that Stenwold would (even reluctantly) send his students out in the field with such inadequate training. The political intrigue also seems a bit shallow at times, the dialogue between him and his fellow lecturers as he tries to persuade them of the Wasp threat is predictable and although the Beetles’ instinct towards appeasement is believable the extent of their blindness to the danger posed by the Wasps does seem a bit unlikely especially given how many potential enemies they had in the Lowlands even before the Wasps appeared. The quality of the writing and dialogue is generally fairly good, although the prose tends to be competent rather than noteworthy. Fortunately, none of these flaws are enough to really detract significantly from the book and once the main plot starts and the action begins the plotting does become more convincing. As well as the excellent world-building the other strong feature of the novel is the interesting characterisation. The characters tend towards the morally ambiguous, and there are some interesting interactions between them. Che is arguably the main character and a fairly traditional fantasy archetype, a young person with a lot of potential but fairly innocent and lacking in self-confidence. Her foster-sister Tynisa is a more complex character, brought up in the civilised surrounding of Collegium she mostly behaves in a fairly civilised manner but when pushed into dangerous situations she finds herself exhilarated by the combat between her and her enemies and she finds she enjoys manipulating, fighting and killing. Salma is superficially a diffident noble but also driven by the desire to defeat the Wasps after seeing the destruction they brought to his homeland. The main antagonist, Thalric, is also an interesting character, a member of the Wasps’ ruthless secret intelligence agency he is willing to do anything and commit any atrocity that might help the Wasp cause but he is increasingly disturbed both by the first flickers of conscience about what he does in the name of the Wasp Empire and by the realisation that some of his fellow Wasps are not as self-sacrificing and committed as he is. In summary, this is a good Epic Fantasy even ignoring the novelty of the book’s unique selling point (the innovative world-building). Occasionally it does feel like the first novel it is and Tchaikovsky’s writing will probably improve as time goes on but it is an entertaining and memorable story and well worth reading.